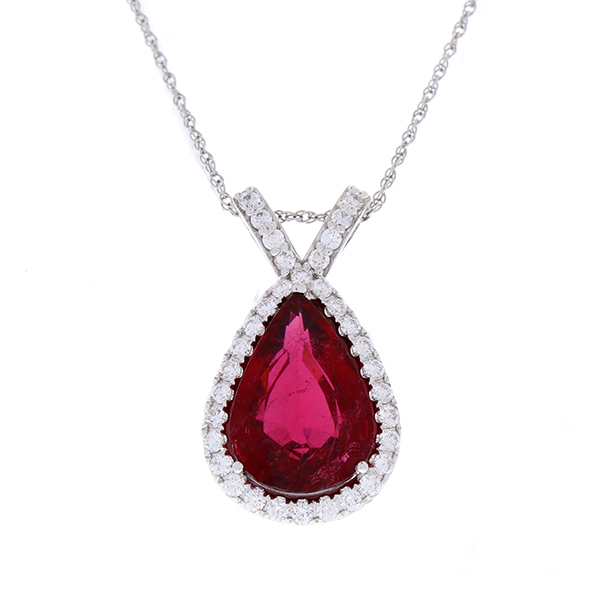 This extraordinary pendant features a fiery pear shape raspberry-red rubellite that weighs 15.99 carat - 20.51 x 13.95 mm millimeter. Its size, with the combination of its color, is rare. The vivid rubellite is sourced from Brazil and exhibits radiant deep pink, purple and deep red colors. A dynamic diamond halo of diamonds surrounds the rubellite and make their way along the diamond rabbit-ear bail. This bail is attractive and secure, allowing your pendant to glide gracefully along the chain. This pendant accompanies with a 14K, 18-inch bead chain of your choice of Rose gold, White gold, or Yellow gold. We have a very well matched ring that could be worn as a set.